A loan of $225 helped to purchase food items. A widow and mother of a family, this woman has been working in the food service business going door to door since 2002. To respond better to customer needs, Mikafumawu is taking out her third loan from our microfinance institution WAGES to purchase some ingredients for making food. She hopes to have a min-restaurant for her sales in order to avoid walking and to support herself better. Translated from French by Kiva volunteer Daniel Kuey. View original language description. Veuve et mère de famille, cette dame opère dans la restauration depuis 2002 et le fait de façon ambulante. Pour mieux répondre aux besoins des clients, Mikafumawu fait sa troisième demande dans notre institution WAGES pour acheter des ingrédients entrant dans la préparation de la nourriture. Elle espère avoir un mini restaurant pour vendre afin d'éviter de se promener et de mieux se prendre en charge. This loan is administered by Women and Associations for Gain both Economic and Social (WAGES), Togo's second-largest microfinance institution. Along with a wide range of savings and loan products, WAGES offers its clients training programs in basic literacy, health care (HIV/AIDS and malaria), and business-related subjects (business management, marketing, accounting). You can show your support for WAGES by joining its lending team! 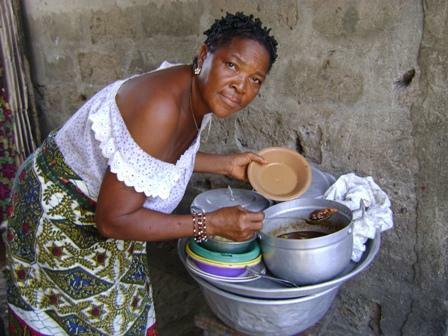 WAGES is a very reputable microfinance institution in Togo, a country that underwent a microfinance crisis in 2009. The institution has not only maintained its credibility and client-base, it has also branched out to offer high-impact loans tailored to underserved farmers and the very poor.